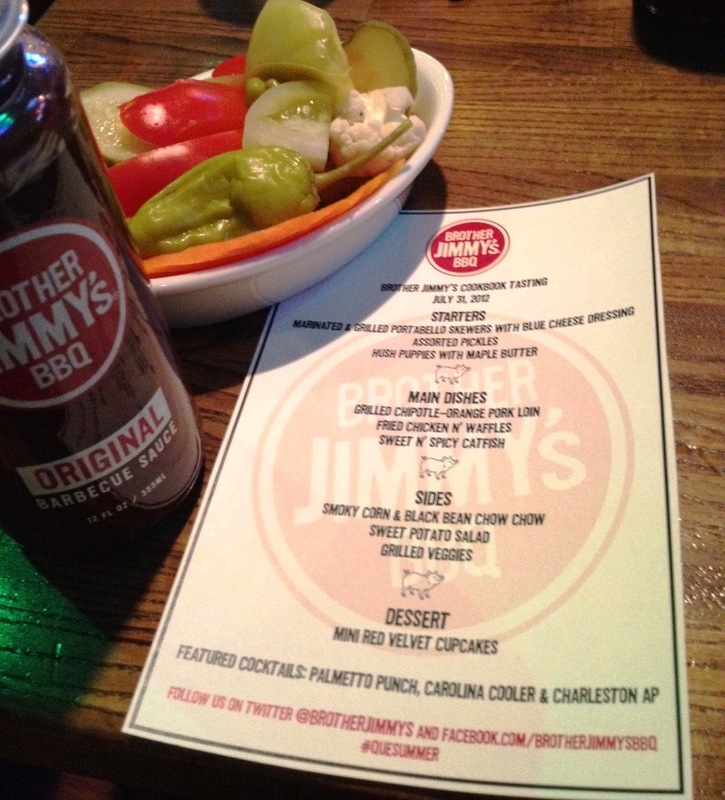 NYC Foodie Girl: Summer 'Ques and a Giveaway To Yous! Summer 'Ques and a Giveaway To Yous! The last few days, my diet has consisted of a lot of 'que. We're talking massive amounts of pork, chicken and corn thanks to the folks at iAdventure.com and Brother Jimmy's. At the first annual BBQ Blowout from iAdventure, I sampled some tasty Smoked Brisket Sliders from Austin, Texas via The Salt Lick's pit master, Michael Rodriquez and am still enamored with the sample from Tom's Bootleg BBQ sauce, served on shredded, oh-so tender chicken (Chef Tom is from "Skinny-At-Last", NY -aka Skaneateles). I also tried some other items at the event that were less than spectacular. I attempted something that another visitor actually referred to as "blasphemous"; she was appalled that bacon was covered in chocolate. To her, bacon was such a sacred treat, to cover it in anything else was sacrilege. After taking a small nibble, I had to agree with her. The bacon was too good to be covered in that kind of chocolate. It was waxy and too thick - just not a good combination. IMHO, if you want bacon and chocolate together, there's only one place that does it right: Vosges (link to their Mo's Bacon Bar here). Anyway, fast forward to a couple of days later, where the peep's at Brother Jimmy's BBQ had a few food bloggers stop by for a tasting menu. 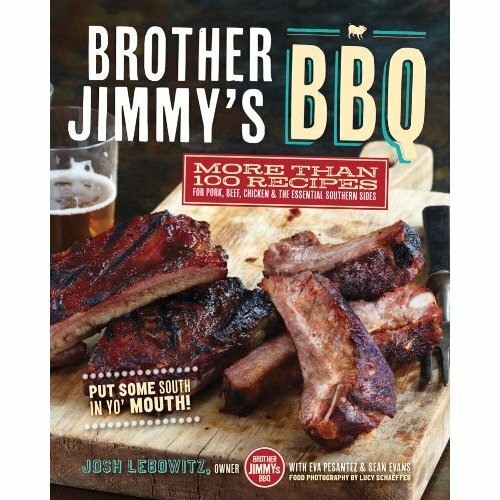 They have a new cookbook Brother Jimmy's BBQ: More than 100 Recipes for Pork, Beef, Chicken, and the Essential Southern Sides out on the shelves and featured some of the recipes from the pages for us to try out for a lunch meet-up. Two words: Fun and Tasty! Marinated and grilled portobello skewers with bleu cheese dressing, hush puppies with maple butter, grilled chipolte-orange pork loin, sweet 'n spicy catfish, sweet potato salad and chilled smoky corn & black bean chow chow made the top of my favorites list. I was live tweeting the event, to include photos - it was a great opportunity to meet other bloggers and also to have a conversation with Chef Eva Pesantez. And now (insert drumroll here), I have a cookbook for YOU as a FREE GIVEAWAY! 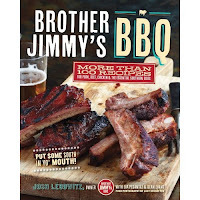 One lucky winner will receive a copy of Brother Jimmy's BBQ recipes! Simply start following this blog (check the right column of this post). Next, comment on this post with something you would like to read about or see on the blog. Winner will be selected on August 8, 2012 using Random.org and contacted via Twitter. An update on this post will also appear once the announcement has been made. love to hear your thoughts on the ice cream trucks in NYC, which ones are best and worth tracking down during a visit! What a great idea!! (And it can add some pounds to my ever-expanding waistline too!!) :) Seriously, will have to do this! Thanks, Dru. I love your honest, insightful reviews. Maybe you can categorize them by cuisine, by area in the city to make browsing super easy.